The sensitivity level you use in Modern Warfare 3 may seem like an insignificant part of your strategy, but it is actually one of the most important choices you can make to make an improvement on how well you play. First though, what is sensitivity? Your sensitivity is a number you choose in the options, varying from 1-10. This number determines how much your aim will move when you move your right thumb stick (or mouse). So if you have it set to 1, your aim will move slowly around, and if you have it set to 10 your aim will zoom around, and you will be able to complete a spin in under a second. Why is this important? Your sensitivity determines how fast you can target someone who is not in your cross hairs. The higher your sensitivity, the faster you can move your weapon sights or cross hairs to be over an enemy, and the faster you can start shooting, and kill them. This means the higher your sensitivity, in general, the better you will be able play. However, this does not completely apply, as the level of skill required to operate a 10 sensitivity is very high indeed. So the best sensitivity is the highest sensitivity that you can use while still being comfortable and being able to shoot your shots accurately. 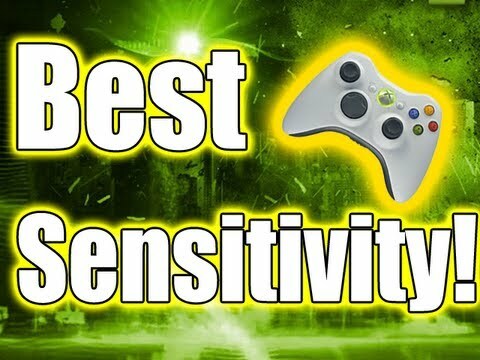 So how do you pick the best sensitivity? The best sensitivity will be different for you based on your ability with your controller. What is the best way to find this out? The next time you are playing Modern Warfare 3, whatever your sensitivity is now, put it up by one. You will find it harder to play for a few games, but after a few games you will get used to it and have all the comfort of the lower sensitivity but will all the ability of the higher. Once you have done this, raise your sensitivity again. This will have the same effect, until a few games after when you get used to it again. Repeat this process until you reach your “skill cap” where you cannot master the sensitivity you are on, even after hours of playing the game. At this point, lower your sensitivity by one to the last one you were comfortable with, and use that. This is your ideal sensitivity, and you should start learning to use this a little more. Once you have completely mastered it, you will be a better player than someone who has not – you will be able to spin and kill enemies behind you faster, kill enemies in high buildings easier, and so much more.Check more info at this website how to get mw3 hack it’s daily updating blog.